The Cisco SD-WAN solution is a cloud-delivered overlay WAN architecture that enables digital and cloud transformation at enterprises. It significantly reduces WAN costs and time to deploy new services, and, builds a robust security architecture crucial for hybrid networks. Enterprises today face major user experience problems for SaaS applications on account of networking problems. The centralized Internet exit architecture is inefficient and results in poor SaaS performance. And branch sites are running out of capacity to handle Internet traffic which is a concern because more than 50% of branch traffic is destined to the cloud. More importantly there are many dynamic changes in Internet gateways and the SaaS hosting servers that lead to unpredictability in performance. 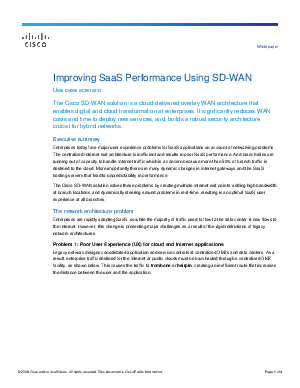 The Cisco SD-WAN solution solves these problems by creating multiple Internet exit points, adding high bandwidth at branch locations, and dynamically steering around problems in real-time, resulting is an optimal SaaS user experience at all branches.